Kalayathumkuzhi Mathews Beenamol, popularly known as K. M. Beenamol (born 15 August 1975), from Kombidinjal, Idukki district , Kerala is an international athlete from India. Beenamol also made history with her brother K. M. Binu, when they became the first Indian siblings to win medals in a major international competition. Binu won a silver medal in men’s 800m race. It was during 2000 Summer Olympics, beenamol was largely unknown, until she became the third Indian woman to reach an Olympic semi-final since P. T. Usha and Shiny Wilson, who achieved almost the same feat in 400m Hurdles in 800m respectively in the 1984 Summer Olympics in Los Angeles. She won the gold medal in women’s 800m and the 4 400 m women’s relay in the 2002 Asian Games held at Busan. 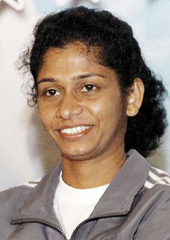 Beenamol was conferred Arjuna Award in 2000 for her exemplary achievement in her athletic career. She is also the joint winner of India‘s highest sporting honour, the Rajiv Gandhi Khel Ratna award in the year 20022003 along with Anjali Ved Pathak Bhagwat. In 2004, she was awarded the Padma Shri.